When you look at Christina’s website, Bridge Bowtique, you see bright and colorful bows. Most of her shoppers would never dream that the business was created as a result of a tremendously difficult time for her family. Christina was thrilled when her son Gavin was born. After working as a first grade teacher for ten years, she cut back to working part time. But it wasn’t long before Gavin began having troubling symptoms: unexplained fevers, back pain and developmental delays. For several years, Christina tried to find someone who could diagnose what was wrong with Gavin. He was treated at different hospitals throughout the country. He had inflammation in all of his major organs, continued high fevers, rashes, and sleep apnea. His illness was undiagnosed and misdiagnosed. Christina became an expert in medical terminology and treatments, and eventually the demands of care grew so great that she had to resign her part-time teaching job. 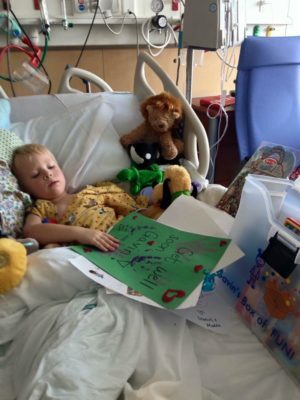 Gavin was initially diagnosed with “Autoinflammatory periodic fever syndrome” which required a $21,000 shot every month. Despite the treatment, he continued to suffer. 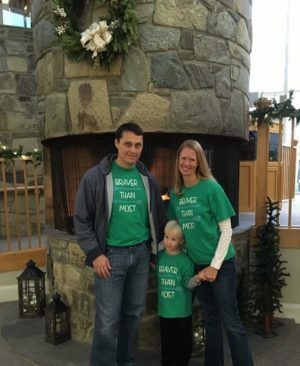 Finally, when Gavin was six years old, he received a Crohn’s Disease diagnosis. As the cost of Gavin’s medical treatments skyrocketed to $80,000 in medical bills, Christina knew she had to do something to help offset these expenses. Unable to return to teaching, Christina knew she needed to do something. The answer came in a simple hair bow. When Christina made some bows for a baby shower, she found the solution. Not long after, she created Bridge Bowtique, which sells beautiful, hand-sewn bows. Today, she sells in her shop and ships nationwide. Gavin and Christina are part of our sunshine community and have received regular touches of sunshine. 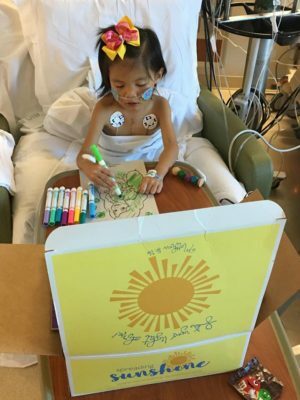 Last year, she wanted to give back so she donated bows to Spreading Sunshine which have been sent to little girls facing medical challenges all over the country. RaeAnn loves her handmade bow from Christina. In 2019, we are excited to welcome Bridge Bowtique as one of the vendors for our Sunshine Boxes. These bows will be included in our Sunshine Boxes. In addition to being an amazing mom and businesswoman, Christina also works diligently to raise awareness and funds for Crohn’s Disease. She collects toys to donate to Johns Hopkins All Children’s Hospital. Show Christina some sunshine love today. Visit her website and place an order. Our sunshine community is filled with people who CHOOSE TO SHINE by making a difference with what they have right where they are.